YOUR ADVENTURES START at DUFFY’S by ATV through 5 miles of scenic Alaska Wilderness by The Trail - a historic route in Alaska used since The Beginning of Time by Alaska Native People and the Russians, the Miners in the Alaska Gold Rush and the Army in WWII - The Trail takes you to our PORCUPINE CREEK Gold Mining Claims in the ALASKA RANGE! We are on the highway and have a runway: YOU MAY FLY, DRIVE, HIKE OR BIKE, TRUCK, RV OR BUS TO OUR TRUE ALASKAN ADVENTURE! YOU CAN PROSPECT OUR CLAIMS 1 WEEK OR ALL SUMMER FREE. READ “PROSPECTORS DREAM” BELOW. GOLD ADVENTURES - *JUNE THROUGH SEPTEMBER! How it works: 1. Sign the agreements; 2. Go prospecting; 3. Bring us samples; 4. Decide if you want to prospect longer or do larger mining. It’s that simple. * *you will need to show up with your small mining equipment (6” dredge or less) and supplies, sign the agreement and then and go to the claims and start prospecting for one week. At the end of one week you must bring us the bagged and labeled samples and required Miners Logs, royalty, coordinates and photos of the testing sites. If you have complied with the terms of the agreement we will, most likely, allow you to continue mining or prospecting all summer long with new terms and agreement. When you decide that you would like to mine the site with larger motorized equipment we will require a new agreement which will allow you to do so after you have received the permits to mine. If you would like us to assist you with the permitting process we will. There is a link to our photo gallery and videos below showing our location (we are in the yellow oval) in the middle of the Porphyry Belt and images showing our location on Highway 1 in Alaska plus a couple topo maps for you to look at - one is of the area and the next one has our claims outlined, also some photos of the trail, creek and the area. 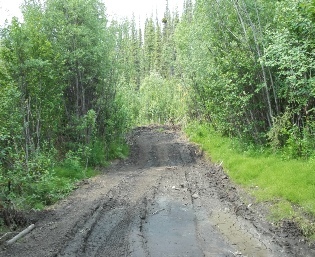 The trail gets muddy at times and may not be suitable for a 4x4 truck but it is generally great for equipment or ATV’s and sometimes good for a 4x4 pickup. The claims start one mile from the highway which is where you can park your vehicle and the Porcupine Creek claims are about 4 miles from the highway. If you prefer you may park your vehicle, camper, RV or Bus at our privately owned property about one mile from the trail head which is the historic Duffy’s Roadhouse and Tavern consisting of 40 Acres and airstrip but no services or hookups. You will need small mining equipment, GPS for locating coordinates, buckets, pans, shovels, classifiers, 1 gallon plastic zip lock baggies for samples that you can write your name, the year, the coordinates and location number on with a black permanent marker, a camera, tent, sleeping bag, tarp (it rains), food, and all of your supplies including water - the creek water may not be appropriate for drinking, an ATV 4x4 to transport yourself and your gear, and everything you need to survive for a few days at a time. However, if you prefer to come back out every day you could do that but we would need to know that you plan to do so. Everything you take back to the claims you must haul out including trash; you cannot dig holes to bury trash plus you must reclaim the spots you prospect. If we agree that you can stay on a spot and mine then the reclamation can be done when the season is over which will be allowed with a signed new agreement. We will give you some coordinates that we want you to prospect and bring us an unprocessed 1 gallon sample plus you can pick areas on the topographic map that you would like to prospect and while you are actually on the claims you can pick spots to prospect at random. We need samples, photos of, and the coordinates of, every spot tested. The black sand must be brought out to us after you have removed the gold from any dirt you process because we will do an assay on it. Do not remove any gold or anything from our samples! You do not pay us for prospecting and we do not pay you and we do not supply any of your food, shelter, water, equipment or anything else. Your prospecting will be limited to a 6” dredge or a highbanker along with small equipment, hand tools and all the necessities to survive. You do not have long term rights to the claim; you or the owner may cancel any time. The written agreement will limit the number of days that you will be allowed to prospect on our claims to seven days. At that time you will need to bring us the required photos, coordinates, samples and royalty that were stipulated in the agreement and the black sand. If you plan on leaving you must bring your gear and everything you took to the claims with you. If, during your prospecting, you have located a spot that you would like to stay at and mine with small equipment you must still return with the required items above on the last day stipulated but, if you want, you could leave your gear and everything else at the location and we could, with new terms, extend the terms of your agreement allowing you remain at that location and mine with small equipment for a longer time or for the season. A second option is to start with a mining agreement which could allow small scale or larger mining operations on our claim after a few days of testing. Just let us know your plans. This is a synopsis of how it will work. We will either send you an agreement to sign or we will have a written agreement for you to sign once you arrive. What is your prospecting/mining experience and with what equipment? What equipment do you own and what equipment do you plan to use on our claims? When would you get here? Note: the mining season is generally early June through mid-September though some years are longer. 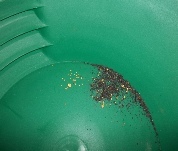 Are you physically able to do gold prospecting? You will need to give us this information when requested so that we can prepare the agreement. We look forward to finding a lot of gold with you and we pray that you have a blessed year. Dates and availability are subject to rescheduling, change or cancellation without notice due to circumstances beyond our control which would rarely, if ever, happen. If we must reschedule, change or cancel Your Adventure we will try to let you know in advance and we will give you options to reschedule. Be certain to schedule Your Duffy’s Adventure well in advance which will allow us to make certain any item you need is available on the date scheduled. Please answer the above questions by email and if you want a customized Adventure to work in teams or clubs with special equipment, for large groups or specific dates and times call or send an email. 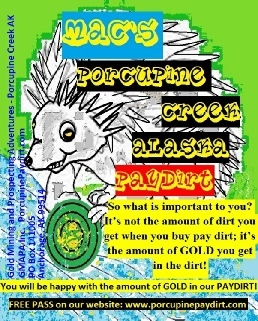 To expedite your reservation you may Click and print this reservation then mail it to us at the address indicated to reserve your FREE ALASKA GOLD ADVENTURE. The form will be updated each year this offer is available. THE PROSPECTORS DREAM: YOU CAN PROSPECT OUR CLAIMS 1 WEEK OR MINE ALL SUMMER! READ “PROSPECTORS DREAM” BELOW - YOU WILL NEED YOUR EQUIPMENT. Duffy’s Roadhouse and Porcupine Creek are: 266 miles from Anchorage; 267 miles from Fairbanks; 82 miles from Glennallen; 63 miles from Tok; and, 4 miles from Slana Post Office. Slana and the Slana River have been an established name for this area since the days of Russian occupation. A telegraph station called Slana Station was established in 1903. In 1917 a Trading Post and roadhouse were established and in 1935 the Nabesna Road came through from the Richardson Highway. A new Trading Post was built on the new road which opened up the Nabesna Mine. The mine was closed during the 2nd World War because of government regulations and the death of the owner around the same time. Don Duffy leased the Slana Roadhouse in 1947 and during that year travel was permitted over the Alaska Highway without special permit. The new Black Top Highway was surveyed in 1950 which bypassed the old roadhouse. At that time Duffy filed on the present ground and began construction of the establishment. In 1972 new owners obtained the Roadhouse from Don and Zaz Duffy. Mac and Monica, purchased the roadhouse in 2007 with the intention of starting Duffy’s Adventures. The Slana Roadhouse, has been an established business longer than any other Roadhouse between the Yukon Boundary in Canada and Anchorage but it was closed for several years. The plans are to again offer visitors from the lower 48, Canada, and all foreign countries a friendly atmosphere, services and A LOT MORE than has ever been offered. GOLD! In the late 1890’s and early 1900’s Gold was discovered in the Slate Creek area and some of the richest deposits came from the Miller’s Gulch and Slate Creek claims. In 1922 President Warren G Harding and in 1924 President Calvin Coolidge signed Patents to D. Roger Englar for mining claims along Slate Creek and other mining in the area included the Nabesna Mine and several small scale mining operations draining into the Porcupine Creek as well as Ahtell Creek. The roadhouse, now owned by Mac and Monica is only a “stones throw” from Porcupine Creek and they would walk it and other creeks in the area with a shovel, bucket and gold pan and test for gold whenever they had time. 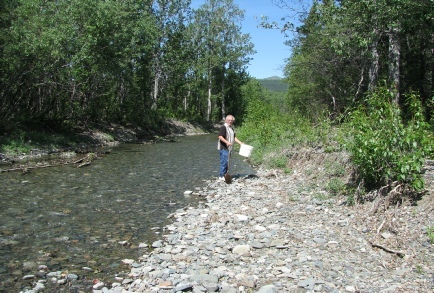 They were getting gold near the surface so they staked or had others stake all of the available mining claims for several miles of the creeks and mountains with the intentions of mining and starting Porcupine Creek Gold Mining Adventures. 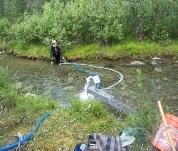 Miners, prospectors and anyone who wants to mine for gold on our Porcupine Creek and take photos of Ahtell Creek, Kennedy Lake and enjoy an Alaskan Adventure may do so for One Day or All Summer. You may hike the 5 miles, bring your own 4x4 ATV or we will take you and equipment back to the claims or rent one of our 4x4’s. FREE Recreational Mining is available to anyone. If you order PAYDIRT, use the Add to Cart button above to order and we will send your reservation.